LeRouxIsPHat wrote: If myself and Joe Molloy are the only two people who follow the Pro14 and don't want to see sh!t games like that then fair enough. There's no sh!t games ion the GP? Who could miss the winner takes 8th decider between these 2 poorly coached and not improving teams. There are...but what's that got to do with anything I said? hugonaut wrote: My recollection was that we gave Farrell an academy deal on the back of his [very good] performances in the JWC, when it looked as though Munster were going to give him an academy spot. Munster probably would have f*cked it up anyway, but we didn't do much better in this case. laughable time spent covering leinster rugby on off the ball this week. along with mot rugby podcasts who barely covered it too. Carbery and Munster are priority. mildlyinterested wrote: laughable time spent covering leinster rugby on off the ball this week. Only time I tuned in, EOS and Ward were talking (for an hour I think) about playing for Garryowen rugby club. Even as someone who actually used to go to Garryowen games regularly, I found it singularly boring; how it was national broadcast material for an hour, I do not know. It was all, pints here, unprofessional days there, bus down from Galway, pulling lads out of the pub to play against Sunday's Well (or whoever). I mean the first time you heard Tony Ward played for Shamrock Rovers, and played in the UEFA cup (from your dad in the late 1980s), it was interesting, but at a certain point, it loses its lustre. Last edited by curates_egg on January 18th, 2019, 4:33 pm, edited 1 time in total. Better that than talking pure shite about us! Well in fairness the Edinburgh v Montpellier games is really where it's all at. Munster v Exeter is really a battle to decide which of them goes thru with maybe a very slight chance of a home QF for Munster being a possibility if Edinburgh lose. Sure there are a few other 'if', 'ands' and 'buts' but there is really no point in getting into them unless Edinburgh lose and get nought. If you think things are bad now just wait until Munster actually win something. It will be back to the bad old days of early 2009 when Leinster were constantly sneered at and Munster glorified. Angelsea Angst wrote: If you think things are bad now just wait until Munster actually win something. It will be back to the bad old days of early 2009 when Leinster were constantly sneered at and Munster glorified. Too true. My dream scenario is we meet and stuff them in the ERCC final!!!!! Yeah because your worst nightmare is the opposite of that. And they say Munster fans have a chip on their shoulder? He is! Best mixture of knowledge and humour in a pundit on TV. Trying to use the media to help get selected is not a good look, especially on the eve of the 6N. ronk wrote: Trying to use the media to help get selected is not a good look, especially on the eve of the 6N. One cracking performance against a poor Prem team does not get you ahead of world player of the year in a World Cup year he might get a nod for Italy or Scotland to see what he can do, but the games fall poorly to make that set up. “I’d love to start all five games but it’s up to Joe,” he continued. “Joe is the best person to pick the team and he knows what’s right so you’ve got to back whatever call he makes. I’d like to get game time but Ireland comes first and whoever the man for the job will get picked." Yeah explosive comments there from Joey, I mean where does he get off! Shocking stuff! It is a bit odd that one good performance surrounded by two not good in Europe have such a clamour around him though. I don't blame Carbery for that, he answers the questions the way anyone would in his position. 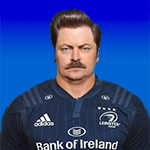 But just imagine he had stayed at leinster:would there be a clamour after one good performance in three to replace Sexton with him? fourthirtythree wrote: It is a bit odd that one good performance surrounded by two not good in Europe have such a clamour around him though. It was the goal of moving to Munster, he knew he would be gaining influencial boosters. He didn’t try to diffuse a story, he planned it. It's an innocuous piece in which Carbery (like most players in a press conference) says little of note. You'd think he screamed in Johnny's face of kneed him in the balls of something! I'd say if he had played all our Euro games, kicked 20/20 and gotten a nomination for EPOTY there would be questions about him starting a 6N game since he's our backup international test 10 yeah. FWIW I think it is important he starts at least once 6N game. I think it's a bit of a hysterical reaction from ronk. When you actually read the piece, there's very, very little of note from Carbery.